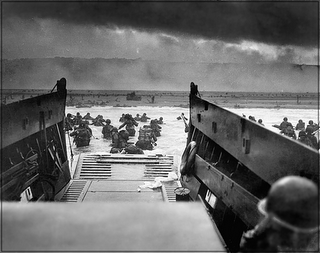 Robert Capas classic image from Omaha Beach when the American boys disembarked in Normandy on June 6, 1944. Below a translated outtake from Kistalight Goes Ryan. Near the village Colleville-sur-Mer is the American cemetery where 9386 mostly young American soldiers received the final rest. In long geometric lines is the simple white cross mixed with Davidstars on the wellcut grass. Here is the rest for sons of farmers side by side with big city boys, black, white as a Jewish and this is a worthy, beautiful and open place on hill and the prospect of Omaha beach. Where some of the worst fighting was under Invasionday.Apart from a few horrendous monuments there is white colonads with walls where there are reliefmaps over invaders with logistic in order to take over Europe. Behind is a memory wall with the names of the 1557 soldiers who were missing after invasionsdays and whose remains never found. Evidence of gratitude for the men that were in combatant and sacrificed their life reappears on the various beaches. It is young people from today to write, locals, colleagues from the various military units, relatives and official persons as politicians and authorities who show their gratitude with their fillets and commemorative plaques. What they fought for; freedom, humanity and democracy is becoming reminded where and rarely has there been so assist in the fight against Nazism. That was the good in a fight against the evil but behind everything was never the less the individual people on both sides. Could not fail to reflect on these issues. Today's war in Iraq, it is basically the good fight against the evil? Certain was Saddam Hussein, his sons, Chemical Ali and Baghdad-Bob basically a rare evil regime as from the wealth and exerted a repression of Iraqi people without mercy. It was right to dispose of them but was driving forces of good and idélla basis? What happens when a totalitarian regime is crumbling and different people, religious directions and not solved conflicts are allowed to to the surface where democratic tradition not belong to the diary. See what is happening in Iraq with what happened in Europe during the first World War. A war which was started in nationalistic rave and revenge feeling and that all thought would be over in a few weeks. A war which stalled in trenches, across, with millions of deaths as a result and with a scenario where the old Europe of Emperors, tsars, monarchies and Ottoman Empire collapse together for good.The war in Iraq as a result of 11 th September, hardly possible otherwise, which started in a sow rave of a technical American supremacy and good will of democratic ideals.There can ever be wrong to overturn a dictator in a "state" and introduce democracy and free elections?Considerations of all those who are interested in the world, history and humanity.What went wrong?Where is the solution?It is possible to consider when one is at the American cemetery and the prospect of Omaha beach and the Atlantic.One fine day when breeze is from the sea. Translation Thommy Sjöberg with a little help from Oxford Dictionary for free - a piece from Kistalight goes Ryan.